De Havilland Mosquito FB VI fighter bomber piilot's manual -- free download. Return to our home page to see more World War II plane videos & pilot's manuals "live online." Mosquitos flew many spectacular missions. Here are a few of perhaps the most memorable. On 11 April 1944, six FB VIs of Number 613 Squadron struck Gestapo headquarters in The Hague, the Netherlands, destroying German records on the Dutch Resistance. Two bombs were tossed into the front door of the building. On 21 March 1945, Mosquitos hit Gestapo headquarters in downtown Copenhagen. On February 17, 1944, in "Operation Jericho" 18 aircraft from 487 Squadron (RNZAF), 464 Squadron (RAAF) and 21 Squadron RAF, all from 180 Wing of the 2nd Tactical Air Force, attacked Amiens prison, destroying the wall and freeing 258 Resistance prisoners, a number of whom were due to be executed. 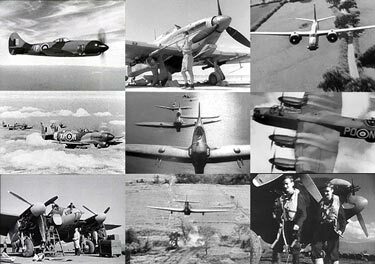 All in all, more than 40 Mosquito variants were developed in the UK, Canada and Australia and the plane remained in service well into the 1950s. More than 7,000 Mosquitos were produced. I'll never forget the first time I encountered the De Havilland Mosquito. I was a teenager and the film was 633 Squadron staring Cliff Robertson and a reliable cast of British actors. The true star of the film was the squadron of real Mosquito fighter bombers flown in many sequences. The most famous scene is where the Mossies scream up a Norwegian fjord to attack the Nazi rocket fuel plant. (Though crude by today's special effects standards, it inspired George Lucas when he shot the climactic attack on the Death Star at the end of "Star Wars."). Those Mossies made the hair stand up on the back of my neck. I was later to discover that this fictionalized account pales in comparison with the Mosquito's many remarkable real life exploits. Geoffrey De Havilland originally developed the Mosquito early in World War II as a two man multi role aircraft that could be manufactured by traditional British artisans in small shops using still plentiful non strategic materials -- wood, glue, and canvas. This made a very lightweight yet strong airframe, which combined with a pair of outstanding Rolls Royce Merlin engines, resulted in an aircraft that excelled "right out of the box." She exceeded 380 mph and was put to use immediately as a day fighter, night fighter, bomber, fighter bomber and photo recon plane. It turned out that the Mosquito had one huge, unanticipated advantage over it's contemporaries. The "wooden wonder" was almost undetectable by radar! Combined with the Merlin's adaptability for both high and low altitude performance, very high air speed, and good handling the Mossy became the preeminent "hit and run" strike aircraft of World War II. High altitude bomber variants conducted small, squadron level night raids deep into Germany. By the time the Mosquitos were detected (often not until they dropped their 4,000 lb bomb loads) they were flying too high and too fast to be intercepted. On the other hand, Mossies were also ideal for low level "Rodeos" over occupied Europe, barrelling in at well over 300mph at tree top level to strike rail yards, ammo dumps, oil depots and other targets requiring a high degree of accuracy. Since they had a two man crew and could carry a heavy radar set without losing performance, they were the RAFs first really successful night fighters. And the day fighter, equipped with four 303 machine guns and four 20mm canon was among the most effective aircraft for shooting down V-1 "Buzz bombs.